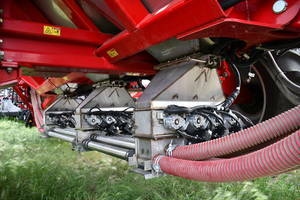 WAHPETON, N.D. — Amity announces the availability of section control for new orders of 3800 and 5250 air carts, providing farmers with the ability to greatly reduce overlap in seed and fertilizer application. Headquartered in Wahpeton, N.D., AGCO-Amity JV, LLC distinguishes itself through a commitment to innovation… consistently providing products on the leading edge of agricultural technology, all with the goal of helping producers cut costs and increase yields. For more information, visit amityseeding.com. Learn more at Big Iron, September 11-13, at booths 90-91-92, 112-113-114.